We’re committed to being both transparent and accountable regarding the resources we receive and use. We strive to go the extra mile, and share more information that required of 501(c)(3) nonprofits. All of our Form 990 (annual tax forms) and audited financial statements are available from founding to the latest filing. 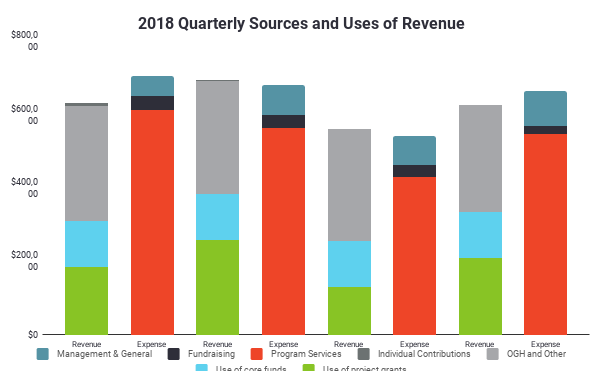 We publicly share our budget projections and actual expenditures quarterly. We strive to set an example in organizational transparency and accountability. As a part of that, we publicly share our sources and uses of funding quarterly as shown below. We endeavor to share timely financial information; however, please be aware that these numbers will be subject to (usually minor) changes until we complete our final reconciliations and investigations at the end of the fiscal year. Our final audited statements and 990 tax returns are also available under "disclosures". From January 1, 2018 through December 31, 2018, Global Integrity secured $9.5 million in revenue, comprised of $8.3 million in Foundation and Government Grants, $1.2 million in Earned Income (mainly from Open Gov Hub licensing), and a small amount of Individual Contributions. Over the same period Global Integrity spent $950,000 on Personnel and related expenses, $1.3 million on direct Program Delivery costs (including Open Gov Hub related expenses), and $303,000 on Office and Administrative costs. 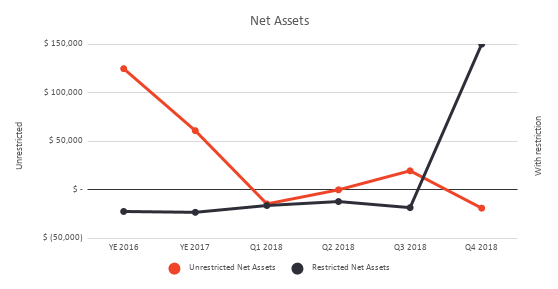 Our operating net income over the period is ($80,000); hence we have seen a change in Unrestricted Net Assets from $61,000 to ($19,000) as shown below. Although such losses are not sustainable long term, we have begun to address this shortfall with new grants such as those currently shown in Restricted Net Assets which increased by $7 million. The funding we have secured will contribute toward both program and support services in 2019 and beyond to create a financially sustainable business model. We are serious about our value of openness and want to make it easier for our partners, funders, and supporters to follow the money that flows into Global Integrity. Our current funders are listed below along with information about the agreement and reporting. A list of prior major funders is also available.